This is among the plants we've been potting up recently. They were grown by David Martin at www.haworthia.com and are all seed grown, most with extensive data. This is a closeup image of Haworthia magnifica var. splendens from GM282 seed. This is just a small portion of a very well designed and implemented rock garden in SE Portland on S.E. Caruthers. Note the two small agaves and the Echeveria glauca in the front. David - the owner - provides the Echeverias some protection from the rain during the Winter. These are a couple of photos from the recent Fall Home and Garden Show. 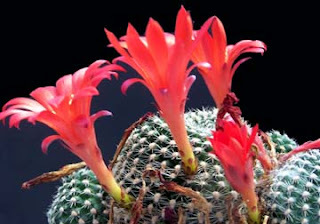 Thanks to Steve Nelson, President of the Oregon Cactus & Succulent Society, for the photos. I know this has nothing to do with succulents, but I was just browsing for some recipes and found this 'interesting', if somewhat macabre suggestion. Oh well, it is almost Halloween! This blog has only been up and running for about a month and we have no idea who's checking it out. Therefore, the question of the day is "Where do you live?" and "What brought you to this blog?" OK, that's two questions, but hey? It may be too soon for very many to have visited here, but who knows? I certainly don't. Help us out here! Hear? Simply add your comments to this blog. Thanks. 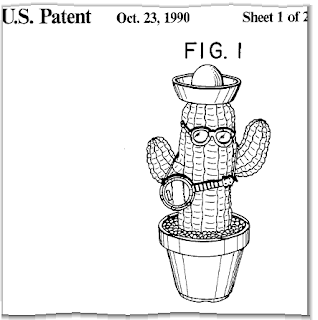 The ornamental design for a motor driven toy cactus, as shown and described. It's hilarious! Did they manufacture this? Can I get one? Who knows?!? I better check Ebay." I checked. Darn! No one seems to have it for sale! This is a plant which received quite a few comments at the Home & Garden Show. It's Haemanthus albiflos of the Amaryllidaceae family from South Africa. It gives a great lift in the greenhouse this time of year. Enjoy. We passed this opuntia this morning as we were driving our mini horse "Ladybug" through the neighborhood. It's on N. Oberlin. First, thanks to all of you who made it out to the show. And "welcome" to all of you who are first time visitors due to conversations at the show. Now it's back to our most unfavorite task of running a nursery, getting things ready for winter. Some of you know that several years ago we had a major garage fire which destroyed many plants and did major damage to the greenhouse. Following the fire, we built the current large greenhouse and have used the old, still damaged, greenhouse for a variety of purposes - without heat. However, it appears that this year, due to a larger inventory, we will be rebuilding the old greenhouse and using it as a cool house (40 degrees F minimum) for cacti only. It should work out ok when done, but in the meantime things are a bit chaotic to say the least. Won't be posting much here for the next few days as we're out at the Portland Fall Home & Garden Show through Sunday. If you're in the area, come out and have a visit -- 11-8 daily with free parking Thursday and Friday at the Portland Exposition Center. Yes, I know. We named this the "Oregon Cactus Blog" and there's ne'er been a single cactus on it's pages since it began! What gives?? When we named the blog, "Oregon Cactus & Succulent Blog" and "Oregon Succulent Blog" just didn't have the right ring to them. So we succumbed to the common (if inaccurate) practice of placing all succulent plants under the moniker 'cactus'. We then proceeded to focus exclusively on that part of our "Cactus Blog" subject matter that isn't cactus at all. So it's time to rectify that with a photo from our cactus collection. This is the plant we chose for our logo. We list it as Rebutia krainziana Kesselring, but it is now generally considered to be a "form" of Rebutia marsoneri Werdermann. R. marsoneri generally has yellow flowers, whereas R. krainziana has very distinctive red flowers. Call it what you wish, it's one of the showiest cacti in our nursery despite its relatively small size, flowering off and on from Spring to early Fall. One plant is still flowering!